Explaining the possible complications from periodontitis to your patients can be a difficult, time-consuming process. 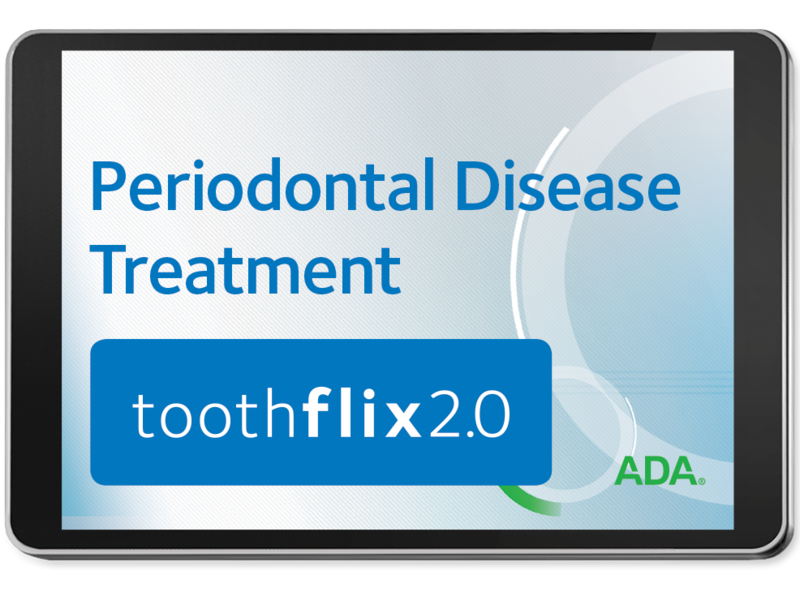 Fortunately, the ADA offers Toothflix® 2.0 dental patient education videos to make patient communication as easy as pressing play! Treating Periodontal Disease is filled with up-to-date content that meets ADA’s high standards for clinical excellence, now in a flexible format that can be played anywhere you have a web-enabled device. If left untreated, periodontal disease can lead to bone and tooth loss, as well as other negative health effects. The first step to fighting back against this disease is by educating your clients on these dangers, as well as the importance of maintaining proper oral hygiene. Our updated Treating Periodontal Disease video accomplishes this in an entertaining and memorable way, helping to improve patient-doctor communication and potentially reduce oral health issues. Your one-time payment allows you instant access to this video, plus any others you’ve purchased, through the online ADA e-Bookshelf portal! More information on our Toothflix 2.0 series can be found at ADA.org/toothflix. Gain access to your copy of Treating Periodontal Disease today, and do your part to increase patient awareness of the dangers of periodontitis.